All four museums will be open starting May 21st and will close August 30th, 2019. The Historical Museum is staffed outside summer opening times. Please call 306-764-2992 to arrange an appointment. 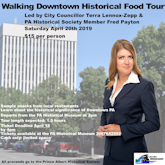 Learn about the history of downtown Prince Albert and sample snacks from local restaurants during this 1.5 hour tour. Tickets must be purchased by 4 pm on Thursday, April 18th. Phone the Historical Museum at 306.764.2992 to purchase tickets (cash only).